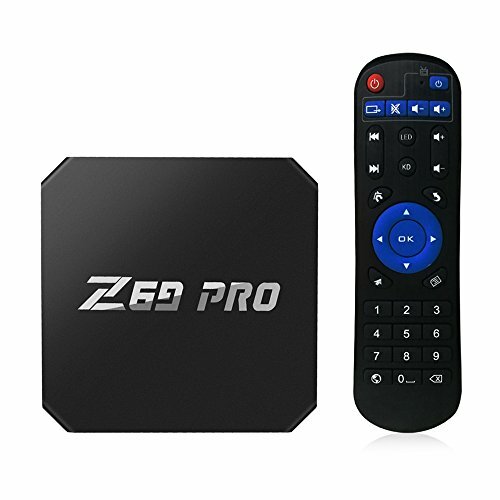 Z69 PRO Smart Android TV Box is your great choice and can change your traditional TV & LCD monitor into a multimedia center by connecting the Internet (Via WiFi or RJ45). This smart Android TV Box will bring you much fun and convenience. Note: The remote controller of the product belongs to attached and functional accessory. If part of product functions can't be controlled by the controller, please purchase external mouse or air mouse to operate. You will have a better using experience. Control Mode: Remote Controller (included) + USB Wired / Wireless Mouse (not included). Miracast & Airplay: Cast the video, audio, pictures from phone or network to TV. Language: English, French, German, Spanish, Italian, etc. Multi-languages. Video Supported: Avi, Rm, Rmvb, Ts, Vob, Mkv, Mov, ISO, wmv, asf, flv, dat, mpg, mpeg. Audio Supported: MP3, WMA, AAC, WAV, OGG, AC3, DDP, TrueHD, DTS, DTS, HD, FLAC, APE. Picture Supported: HD JPEG, BMP, GIF, PNG, TIFF. [Android 7.1 OS] Runs on Android 7.1 System which is perfect in productivity, stability and performance, along with various of features and optimizations, delivering an improved user experience. [Amlogic S905W CPU] Powered by Amlogic S905W Quad core ARM Cortex-A53 CPU up to 2.0GHz ultra high frequency, Z69 PRO is a HD media player with Mali-450 penta-core, up to 750MHz GPU. [Memory & Expandable Storage] 1GB RAM, 8GB ROM and TF Card Reading up to 32GB give you more space to store your favorite media files and to browse websites, play games, watch movies more smoothly. [HEVC H.265 & VP9] H.265 decoding occupies less bandwidth (about 50%) than H.264; H.265 and VP9, powerful decoding capabilities, can decode most of the file formats at present. [Your Own Home Theater] Once connected Z69 PRO with your WiFi or RJ45, your HDTV becomes into a smart streaming machine. You can watch movies and play games from the Internet, making home entertainment easier. View More In HD DVD Players.